Can Angular framework be used in a Non-SPA (Single Page Application) way? Here is my attempt to use Angular Elements in ASP.NET Core 2.1 and use the Angular framework in a Non-SPA way. Many of developers just like me got excited to use the Angular framework along with ASP.NET MVC either in MVC 5 or Core. I was tasked to use Angular in existing or brand new MVC application, here are my experience of using Angular with ASP.NET MVC. Using these server-side technologies is not easy & so much work needs to be done just to check its feasibility. I am talking about pre-Angular CLI days, I had to demo a small POC of Angular & MVC5. The reaction was it’s too much to get started. But still business wants to use it. My GitHub repo ng2Mvc5Demo has 120+ Stars, it indicates that everyone wants to try out Angular. AngularJS was very easy, either download using NuGet or download using CDN and start developing. It can be used when needed i.e. suppose I wanted to use AngularJS in only 3 pages out of 10 pages, then it was so easy. But with Angular, it was not possible because of components being used in every cshtml page and routing approach to load them. The learning curve for Angular is quite a bit in terms of TypeScript, RxJS, Component-based architecture, a different ecosystem of tooling etc. With this learning curve, the overall getting started with Angular was turn down. In Enterprise, we don’t have the luxury to train extensively. I hope many developers would feel the same. Create ASP.NET Core 2.1 (MVC) application. Using the Angular CLI, we will be creating Angular 6 application inside the root directory of this MVC application. This step itself is a blog post, check out my article Using Angular inside ASP.NET MVC 5 with Angular CLI using Visual Studio 2017 for detailed integration steps. Even though the article uses ASP.NET MVC 5 but still everything can be applied to ASP.NET Core. 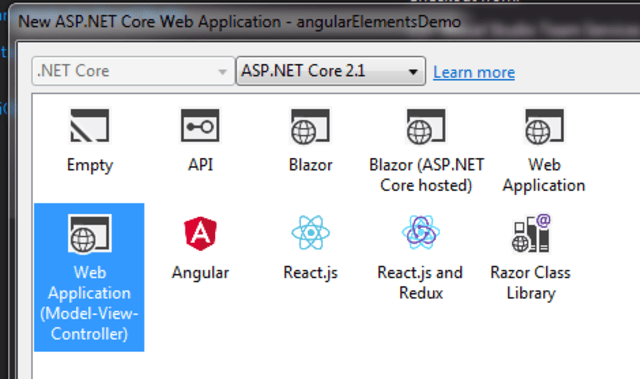 Once you’re up & running the Angular application in ASP.NET Core, its time to add one simple component. Using the Angular CLI lets create a component by running the command ng g component my-todo. This creates Angular Component along with template HTML, styles related file. This Component lists my TODO items and lets me add one. Its very simple Angular Component and a good start for us. The component file is shown below, very straightforward myTodos to hold an array of strings, initiated with predefined values. An addMyTodo method to add to myTodos array. Run the ng build –watch in command line and refer the necessary script files in About.cshtml; running MVC project & navigating to About page, you would see a similar view. Up until we have successfully integrated Angular app unto ASP.NET Core MVC application and run the application to see the above result. The source code until this point is in the MASTER branch of my Github repo. To this point we haven’t come across Angular Elements concept, it was just Angular application being built. The very first question arises is “What are Angular Elements?”. There is in-depth documentation on Angular Elements, a must read. Now run the command ng add @angular/elements from the root folder of the project (folder containing angular.json. It will start adding Angular elements package to existing Angular application. Our aim here is to convert regular Angular Components into Angular Elements. One of the steps is to set encapsulation of component as Native. That is it will convert the component’s style, template & template class into a single file. Registering the MyTodo Component in @NgModule is the most important step to convert into Angular Element. Builds a class that encapsulates the functionality of the provided component and uses the configuration information to provide more context to the class. Takes the component factory’s inputs and outputs to convert them to the proper custom element API and add hooks to input changes. In short, it converts angular component as regular HTML element (like Input, Select, Radio etc) and understandable by various browsers (of course, polyfills needed for the older browser). In our case or in general Angular Elements are neither part any other components or root of the Angular application. The Angular compiler needs to be informed that they must be compiled by adding to the entryComponent list of @NgModule. As Angular Elements are self-bootstrapping, they act like normal HTML elements by bootstrapping automatically and adds itself to the DOM tree. For this reason, we have to add ngDoBootstrap() method to mention the list of angular elements to be loaded. In the above example, we converted a regular angular component into an angular element (custom element). Let’s create another component which talks to GitHub APIs & uses RxJS to map objects to particular class. Run the following Angular CLI command generate Angular Component ng g component git-repos -v Native . box to search enter the GitHub Username to fetch their public repository and its starred count. ViewEncapsulation is Native - It combines template, styles, components into a single file. Using RxJS map operator to transform API response for our needs. Remember to subscribe, to call the API. The mytodo-element is a custom HTML element we created in the above steps. Repeat the same for the github-stars custom element also. Now that we are ready for with Angular Elements development and tested it as in Chrome browser :). Use NPM scripts to create PROD worth bundle of the Angular app (i.e. angular with elements JS files). Invoke .NET Core publish from NPM scripts. The publish-for-deploy script entry generates production-ready angular (elements) files in wwwroot/dist/ folder and also creates .NET Core publish folder in Release mode. Run this command from command line from project root folder npm run publish-for-deploy Once done with this publishing step, goto bin/Release/netcoreapp2.1/publish folder to deployment-ready build of ASP.NET Core with Angular Elements. You can deploy this on IIS or Nginx. 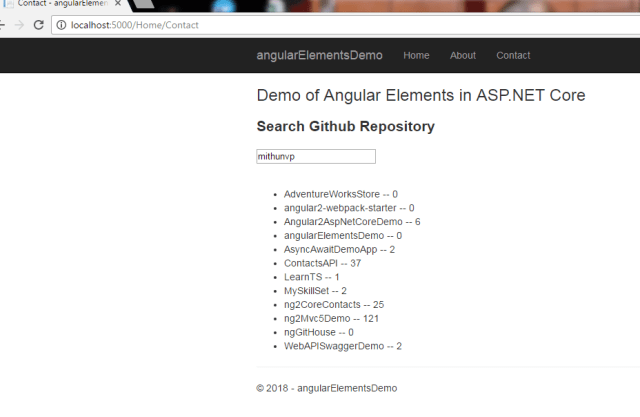 Check out my GitHub Repo angularElementsDemo with branch name angular-elements for source code. Tried to demonstrate usage of Angular in non-SPA ASP.NET Core MVC application.